NOTE: Jack Plunkett BROWNE was a captain at the time of this photo (to the left) but was made a Major "during the War of 1914-1918".The photo beneath shows BROWNE in 1924, near Cairo. Apparently, he was associated with the Military College. I have no record of a marriage. In the 1911 Census he was living with his two brothers Edgar Monteagle BROWNE and Hugh Edgar BROWNE in Kensington at 1 Drayton Gardens, S W London. He was a Lieut Special Reserve. The three brothers were all single at the time. 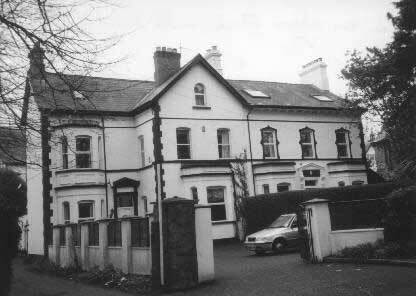 His will probate: BROWNE John Plunkett of 57 Lansdowne-road Holand Park London. Probate London 4 January to Samuel Francis Peter Blythe, solicitor. Effects 1436 9s 8d. Resealed Cairo 24 April 1933. The annual inspection of the above company was held in the Deacon Memorial Hall on Tuesday evening. The company paraded at full strength, under the command of Captain E.H.H. 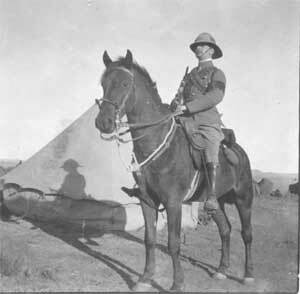 Lloyd-Dodd, the following officers being present - Major M.H.G. Willis, Lieutenants Rev. W.A. de V. Dodd, R.B. Kelly, W.G. Ferry, and Staff Sergeant Hawe. The inspecting officer, Lieutenant J. Plunkett Browne, 3rd Battalion Inniskilling Fusiliers, was received by the company with the general salute. The following buglers took part - J. McKelvey, F. Kee, and F. Macdonald. The inspecting officer then proceeded to inspect the company and complimented the lads on their fine and smart appearance. The lads then marched past in quarter column. In the drill-down, which followed, the competition was very keen. Medals were presented by the chaplain, Mr. T.W. Dodd and Mr. A. Spence. 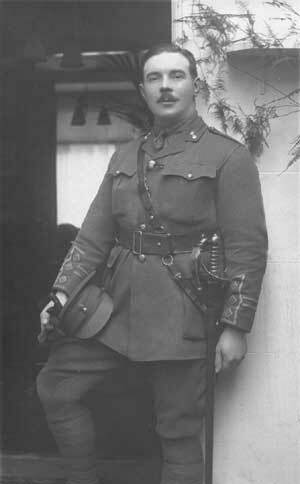 The final result was - 1, Private W. Hynds; 2 Corporal Hill; 3 Bugler F. Macdonald. The inspecting officer, addressing the company, spoke of the advantages of physical drill, especially to lads living in the city, and how necessary it was to have a sound body and good physique to take part successfully in the battle of life. It was his second visit to the company and he was very pleased to notice the change in the bearing of the lads. He complimented the lads on their drill, smartness and efficiency, and wished St. Michael’s company success in their work. The chaplain replied on behalf of the company and thanked Lieutenant Browne for his kindness in coming to inspect. He said the aim of the C.L.B. [Note: St. Michael’s Church Lads Brigade] was to make the lads good Christian men, and that character was being formed by their attention and obedience and drill. Captain Lloyd-Dodd called for three cheers for Mr. Browne which were given with good will. The singing of the national anthem brought the proceedings to a close. The Royal Inniskilling Fusiliers Regimental Museum is at: The Castle, Enniskillen, Co. Fermanagh. It may be worth a visit. Tthe 3rd Battalion was a reserve batallian and on August 1914 was in Omagh and remained in Ireland until April 1918 and then moved to England. Given that BROWNE was promoted to Major during the war, it may also be possible that he saw action on the field. Hard to say. In the news announcement of his brother Edgar’s DSO, he is made reference to, so we know that he was still in service in 1917 (as were all four surviving brothers).